Software Used Images Plus 5.75 for camera control, calibration, stacking, digital development, feature mask, smoothing and noise reduction, and multiresolution sharpening. Photoshop CS5 used for levels and curves, high pass filter, screen mask invert, and unsharp mask. Gradient Xterminator for gradient removal. Focus Magic for focus restoration. Registar for stack alignment and registration. Notes This is my first light image with my new monochrome Canon 450D. 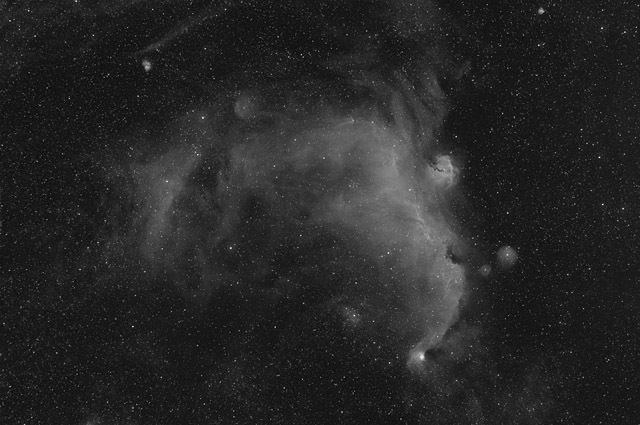 I had started imaging this object with 10 hours of data from my color camera, but ended up finishing the data with another 17 hours from the monochrome camera. Because the monochrome camera provides much sharper detail than the color camera, I used some special techniques to use the data from the color camera data to only blend in the faint parts of the nebula, and allowed the mono camera data for the main image. The result was that I was able to reduce the noise in the fainter areas, while retaining all the superb detail from the monochrome camera. The new camera seems to work extremely well for gathering narrowband data, and I expect it to be a very useful piece of equipment to complement my other camera.